Killer Characters: LET'S TALK TURKEY! Thanksgiving may be over, but you can revisit our favorite holiday anytime you like on the pages of A Fatal Feast. Here is a short excerpt in which I am hosting Thanksgiving dinner. I've invited a special guest, but not everyone is happy about it. Conversation stopped and everyone looked at me, and then beyond to Hubert Billups, who stood in the archway between the living and dining rooms. Billups remained motionless, a blank expression in his eyes. He’d obviously washed up, and had trimmed his red beard a little. I was pleased that he’d shucked his usual uniform and wore for this day a yellowed, slightly stained, double-breasted white dinner jacket, gray shirt, skinny black tie, tan cargo pants, and low black sneakers, a proud man who’d tried to dress for the occasion. Across from him, Mort was in shock, his face a wrinkled question mark as he looked at me, then back at Billups who’d taken his seat. 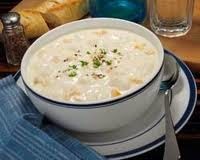 Susan Shevlin ladled chowder into the new arrival’s soup bowl and placed a salad next to it. “Jessica, can we talk?” Wilimena whispered in my ear. We went to the kitchen. “Jessica, what have you done?” she asked in a low, panicked voice. Wilimena sighed deeply and crossed her arms in front of her. “This is terrible,” she said. Her comment surprised me, and I asked why Billups’s arrival had upset her so. Her face was set in a concerned scowl as she grabbed her cane from where she’d hung it on the counter, and squeezed past Mort who was coming in the kitchen. “Are you having some kind ‘a breakdown, Mrs. F?” he asked. “Of course not,” I said. Mort shook his head. “You’re always full of surprises,” he said, and departed the kitchen. I followed him and saw that Billups had finished his chowder and salad, and was listening to something Jim Shevlin was saying. 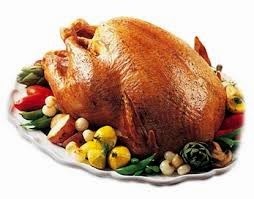 “Everyone ready for Tom Turkey?” I asked brightly. Hope you had a wonderful Thanksgiving with those you love. 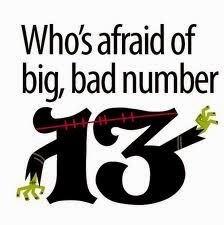 Lots of people are superstitious about the number 13. Are you one of them? This year is the Silver Anniversary of “Murder, She Wrote” in print. There are 42 books in the series so far; the 43rd will be out next Spring. Plus, we have a new contract for three more mysteries for your entertainment. Wishing everyone a happy healthy holiday season. Don’t forget to come back in December for Killer Characters’ “Season’s Readings” spectacular with a book or gift giveaway every day of the month. Thanks Dianne. We're not afraid of the number 13. In fact, some of our favorite people were born on the 13th of the month (even on a Friday). Thanks for stopping by. And then there's this saying, "The more the merrier." That may not always be true, either, but I like aiming for merriment. We agree Willow! Bring on the merriment. 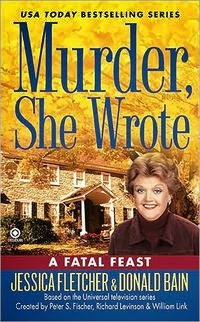 Congratulations on your amazing success with the "Murder, She Wrote" series. Long live Jessica Fletcher! Thanks, Sheila! We'll raise a glass tonight to Jessica Fletcher and all the folks in Cabot Cove. We're writing about them again. I love the series and can't wait to dig into KILLER IN THE KITCHEN. I read A FATAL FEAST last Fall and loved it. Your series is so reminiscent of the television series. When I talk about the series with other readers; I always tell them I can hear the actors voices when I read the character dialogue. They are so wonderfully written, thank you both for the series. Happy Thanksgiving! Thanks for your kind words, Margaret. Killer in the Kitchen will be out next April. We hope you enjoy it, too. I am so glad the Murder She Wrote Books retains the original flavor and characters. Congratulations on your Anniversary. I was a big fan of the TV Series and I am just starting to read the Books. Thanks, Marilyn. Glad you've found the books. I'm not superstitious - touch wood!! LOL! We do the same thing.